Customers with a TechSmith Relay site and 3Play Media account can set up an integration to streamline the closed captioning workflow. Setting up the integration will require the assistance of your TechSmith Relay Customer Success Manager. 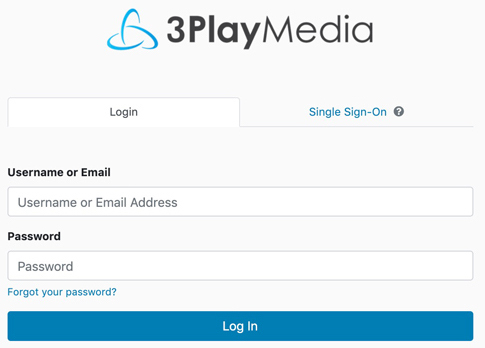 3Play Media's API v3 module must be activated to take advantage of this integration. If the module has not been activated yet, follow the steps at the beginning of this article to request access. Once API v3 has been activated, follow the steps below to get started. Log into 3Play Media and, if you have multiple projects, switch to the project where you want TechSmith Relay captioning requests sent. Click Settings located in the upper, right-hand corner of the page. Under Basic Settings click API Access Management. Name this set of API keys something to easily identify that it is associated with the TechSmith Relay integration. For Enabled set this to On. For Access Type set this to Project and then click Create Access. 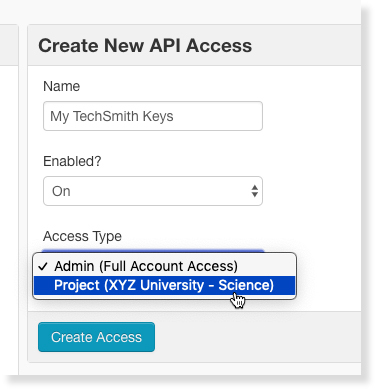 Copy the API key information as this will need to be shared with your TechSmith Relay Customer Success Manager. Before contacting your TechSmith Relay Customer Success Manager you will need to determine which turnaround service level will be best for your closed captioning requests. This will be the turnaround service level applied to all close caption requests that are made through this integration. Click here to learn about all turnaround service level options. Once a turnaround time has been chosen and API v3 keys have obtained, contact your TechSmith Relay Customer Success Manager. He or she will set up the integration and then schedule a training call to walk you through the feature using your Relay site.